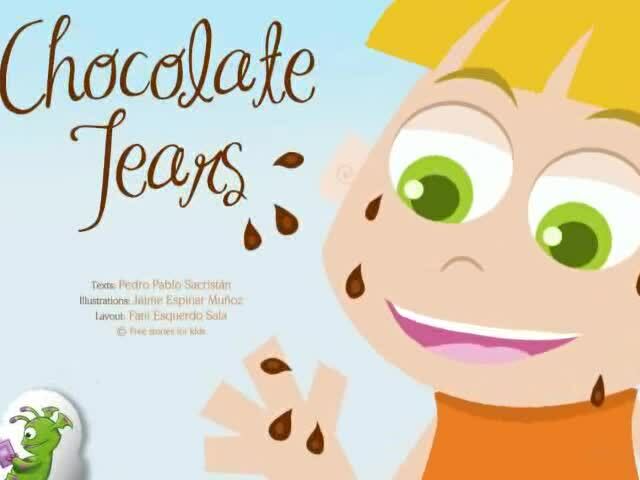 Chocolate Tears. Animated story narrated in British English. Camilla Chomp was a very greedy, gluttonous little girl. She hardly had any friends because she thought it was much more fun to spend her time alone, eating cake and pudding. Her parents were worried, so they took all the sweet food in the house and hid it. So Camilla left the house, desperately looking for something sweet to eat. On she went, until she ended up in a small abandoned hut full of old pots and glasses of all shapes and sizes. Out of all of them, the one that most caught Camilla's attention was a shiny little bottle made of gold-coloured glass. It seemed to be full of chocolate, and Camilla took a quick swig. It was delicious, but she felt a strange tickling sensation, so she read the label. "Glass Tears", it said, and in small print it explained: "Magically converts tears into chocolate." Wow, was Camilla excited! She ran everywhere looking for someone who was crying, and she came upon a little girl who was weeping disconsolately. Sure enough, her tears were converted into chocolate, and as they ran down her cheeks, to her mouth, they sweetened her lips. That soon stopped her crying. Camilla and the girl spent a fun time together, tasting the delicious tears, and they parted as friends. Something similar happened with a woman who had dropped some plates, and with an old man who couldn't find his walking stick. The appearance of Camilla and the chocolate tears cheered up those sad faces, helping them smile once again. Soon Camilla realised that cheering people up was much more valuable even than chocolate. Her mad search for sweet food stopped, and her search became one for sad people who she could try to help. And from those sweet encounters came a mountain of friends that filled her life with meaning and happiness.